Screech! What was that you might be wondering? Well, that is the sound of a mineral called a diamond being scratched on a window. Or was it the window scratching the diamond? Well, let’s start off with what a mineral is. 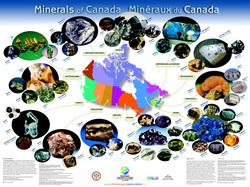 A mineral is a chemical element that is naturally occurring and has a crystal structure. It is made up of 2 or more elements, and you will learn all about crystal structure and much more! Hardness? How would you test mineral hardness? Well, if you want to test the hardness of the mineral you will have to use the Mohs Hardness Scale. What is that you might be wondering. It is a scale that will tell you all about the different minerals hardness and what level it is and what you can use to scratch it. The Mohs Hardness Scale rates from 1 to 10. 1 is the softest and 10 the hardest. 1. Talc - Can be scratched by a soft pencil point. Light gray, dark gray? What one is it? The color of the mineral is a very important fact. It can change what the mineral is. For example minerals may look the same but the color of the mineral can change it completely. You may think it is one mineral when actually something totally different! Red, Yellow, Blue, Pink! These are some of the color streaks a mineral can make. But, it could have no streak or just a colorless streak. A streak is a line of color that is made when you scratch a mineral on a porcelain tile. That color will help you tell the difference between 2 minerals that look alike. For example gold, and fools gold. The color looks the same but the streak helps tell them apart. Fools gold leaves a grayish color streak, and the real gold leaves a yellowish ting. The streak is the second way to tell the difference between the different minerals. The hardness of the porcelain is 7, so, that means that any mineral that is harder than that won’t leave a mark. Wait a mineral can fracture something… like it’s arm? No because minerals don’t have arms. The kind of fracture that happens to them is if they break and the piece that breaks off is a jagged edge. But if a piece breaks off and it is smooth it is called cleavage. All different minerals do different things. Some cleavage, others fracture. The crystal structure scale shows the different minerals and what shape they are, for example halite is a cubic shape. Albite is a triclinic shape. There are a lot more. That is the third way to tell the minerals apart. If we didn’t have it, it would be lot harder to figure out what mineral is what. There are seven different types of structures…. Shiny or not shiny? That is what lustre is. It is whether a mineral is or isn’t shiny. There are 2 groups, metallic and non metallic. Metallic means it is shiny, and since metallic is shiny, non-metallic means the opposite. It isn’t shiny. Here are some examples of non-metallic. Silky- the mineral feels like it is silk. Adamantine- The mineral shines like diamond. 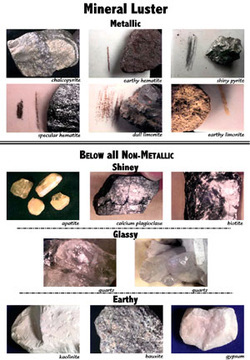 Minerals are what make up rocks so these same test would work on rocks and can help you tell them apart, but, you will learn all about rocks and there different kinds on the next page.